Long, very slender and markedly compressed snake ( body distinctly elliptical in cross section ) with a very long and more cylindrical tail. Can grow to a maximum of about 1.90 metres. 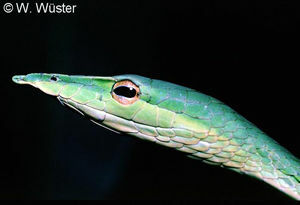 Head is distinct from neck, elongate ( more than 3 times as long as it is broad ), depressed and snout very sharply pointed with a rostral appendage. Eyes are large in size with horizontally elliptical pupils and golden iris. Dorsal scales are quite dull, smooth and oblique with vertebral scales slightly enlarged. Dorsal scale count 15 - 15 - 13 ( 11 ). Found in low bushes, shrubs and trees in lowland forest terrain at elevations up to about 1000 metres, particularly near streams and often found near human settlements. Diurnal and arboreal, but may descend to the ground to search for food. It moves quickly in trees in pursuit of prey, but is generally a slow-moving and elegant climber. If cornered or provoked it will rear its forebody, curves and dilates its body exposing the black and white pattern of the skin and opens its large and elongated mouth in a menacing appearance. It is able to extend about half its body length and sway slowly whilst moving its head irregularly to simulate a tree branch. Generally mild disposition but does have a reputation for striking at the eyes ( Ahaetulla = eye-picker ) if not held securely or threatened. Feeds mainly on calotes ( and their eggs ) and geckos, birds, frogs, slugs, mice and occasionally other snakes.